After 3 weeks time, the shop sales person has called back, asked me to collect the lens at Pavilion on 29/9/15 which is 2 days ago. Thank's god, you are finally back. I will protect you, take care you, sayang you. Its been a very hard time attending event & taking pictures with a giant lens. My self is feeling weird. Bad temper, back ache, tummy blotted, breast tenderness, abdominal cramp & farted alot especially during 2am onward. The cramp feels just like menstrual cramp and i do remember this kind of symptoms appear during my pregnancy time...*pray pray pray* i wish my dream to have another family addition will come true [fyi: me & hubby has been trying very hard to conceive for 15 months now] and i even had a early miscarriage (almost 5 weeks) on July due to the ovum (egg) not attached strongly at the wall. She is asleep now. I went to the kindie at 11.30 and the class finished at 12pm. The teacher said that she is a very steady & active child =) [glad to herd that]. Arrive home at 12.10pm. Bath eat then nap...Only use 30 minute & less to settle all.Never try this fast before. Maybe because she is hungry & tired. I'm proud of her. Kids do grown up so fast. 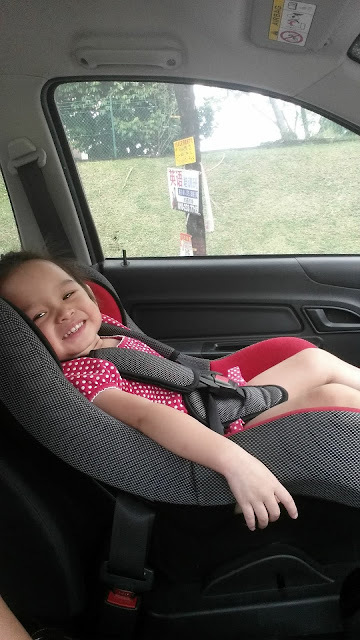 In a blink of eye, she almost turn 3. I do still remember the moment doctor took her out from my tummy while i'm lying on the cold operation table with half body numbed. 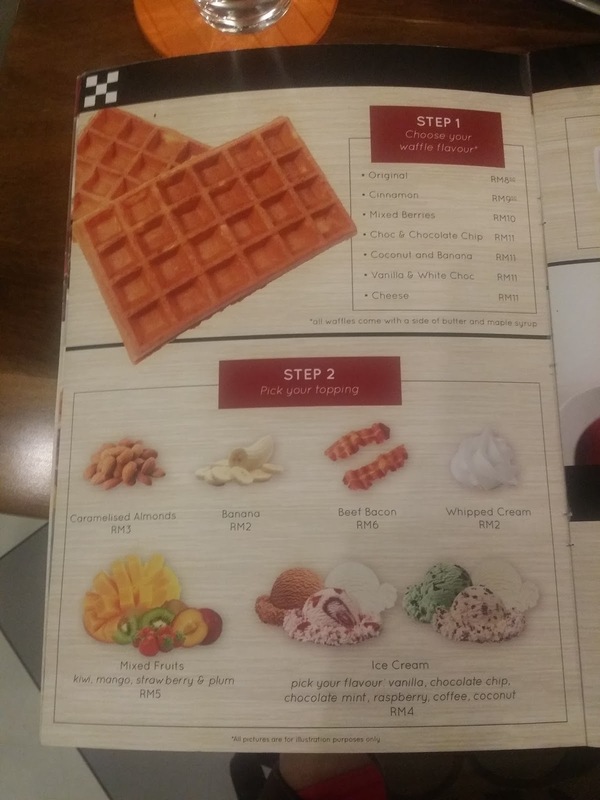 Any Waffle lover here? 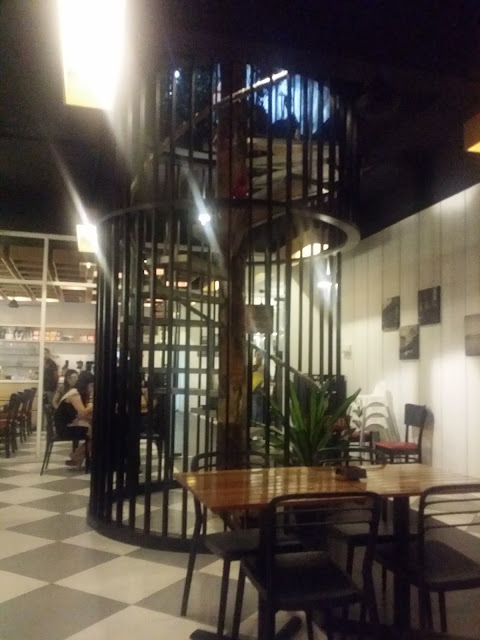 I have one interesting restaurant / cafe to introduce to you guys. 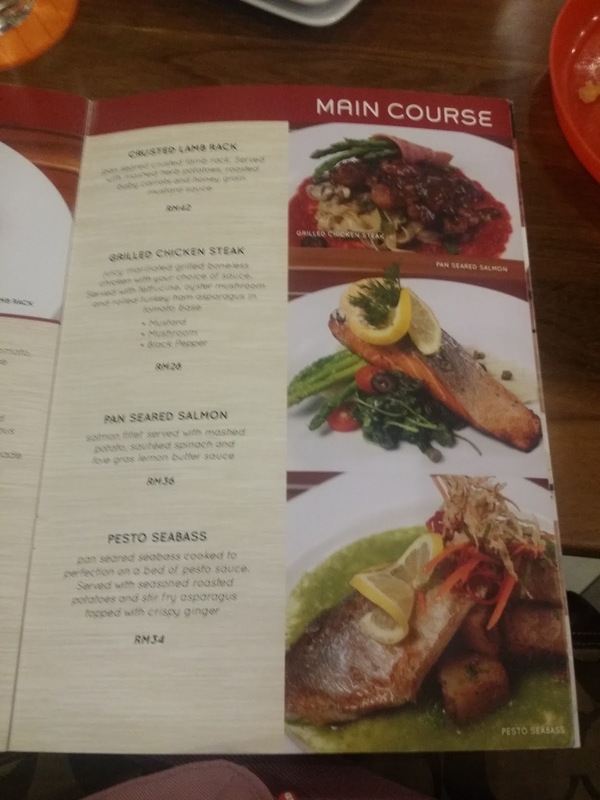 Without further delay, here i present you the Restaurant. 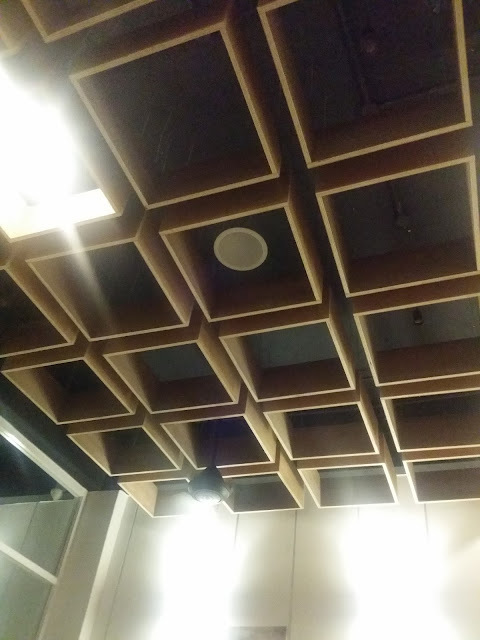 They have 2 area just like most of the restaurant out there. Indoor & Outdoor. 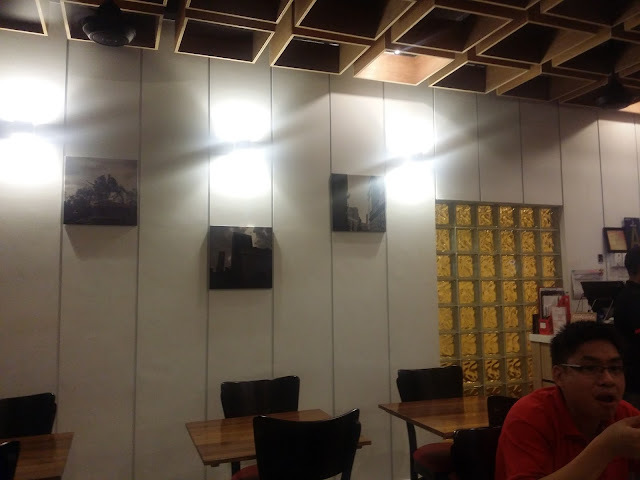 Located at TTDI, just 5 minute drive from 1 Utama. Savory waffle sandwhich with turkey ham & tomato wrapped with egg. Served with cheese sauce topped with a sunny side egg. 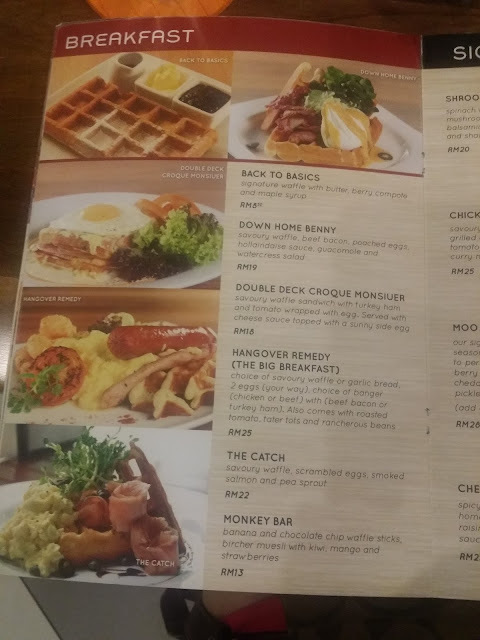 Savory waffle, beef bacon, poached eggs, hollaindaise sauce, guacomole & watercress salad. Signature waffle burger made with seasoned striplain beef patty seared to perfection. 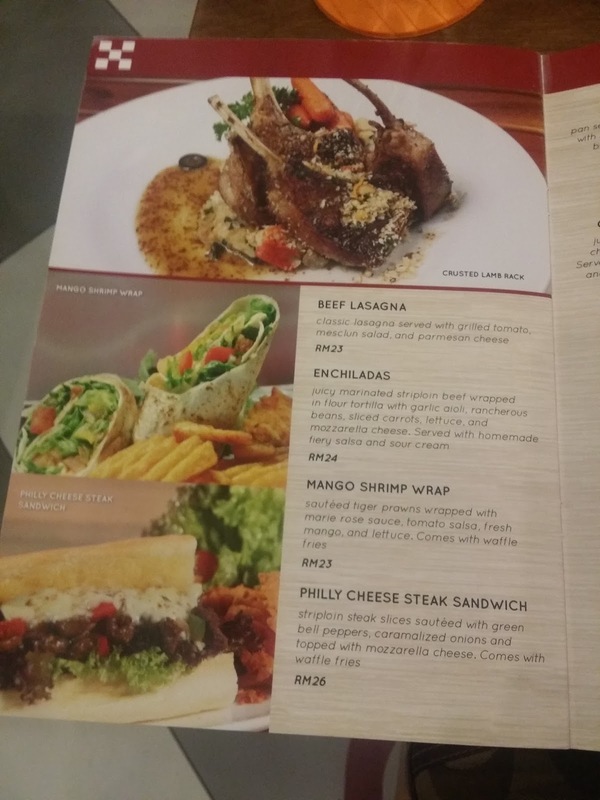 Served with homade berry barbeque sauce, beef bacon, cheddar cheese, raisin slaw & picked relish. Comes with waffle fries. 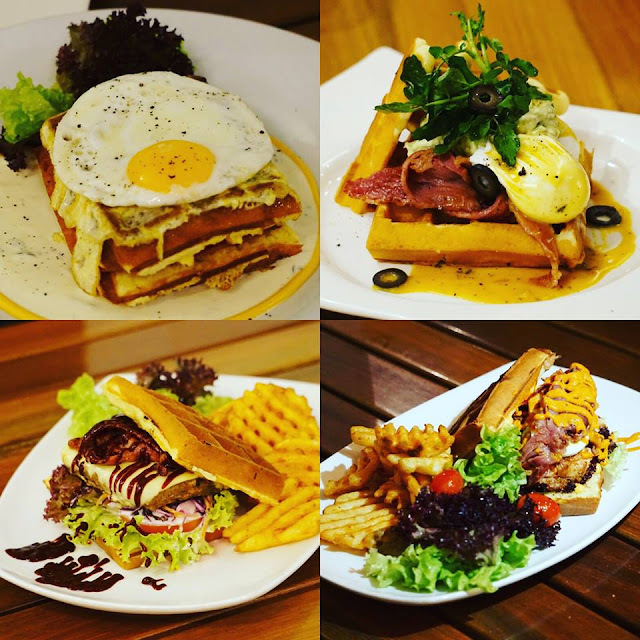 Savoury waffle sandwich wit marinated grilled chicken, beef bacon, sliced tomato, boiled egg, guacamole & curry mayo. 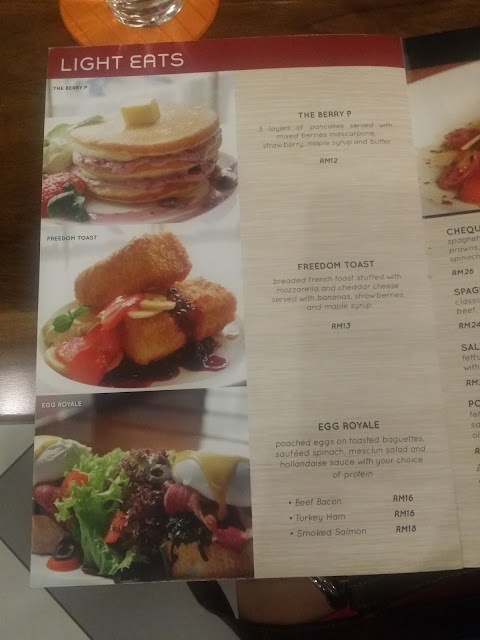 Comes with waffle fries. juicy marinated grilled boneless chicken with your choice of sauce. Served with fettuccine, oyster mushroom, and rolled turkey ham asparagus in tomato base. Sauteed tiger prawns wrapped with marie rose sauce, tomato salsa, fresh mango & lettuce. 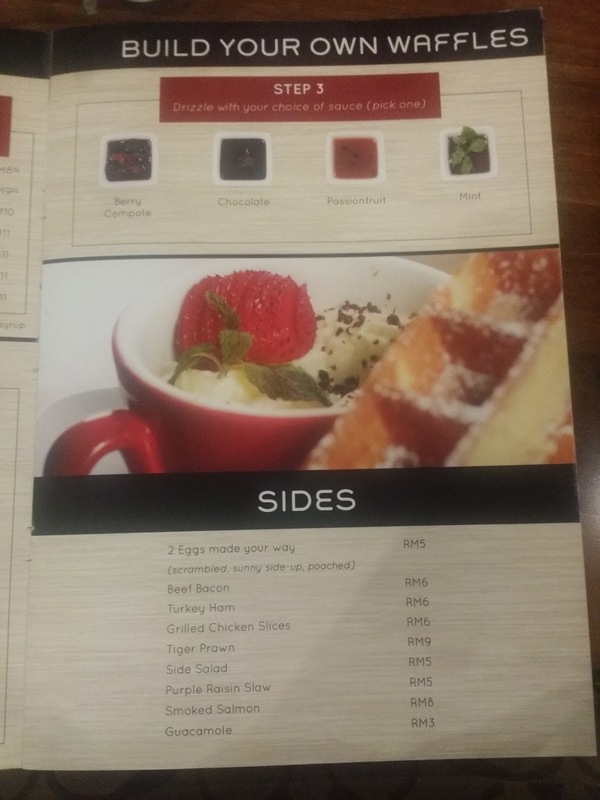 Comes with waffle fries. Pan seared seabass cooked to perfection on a bed of pesto sauce. Served with seasoned roasted potatoes & stir fry asparagus topped with crispy ginger. Chocolate chip waffle, hand battered banana fritters, almond nibs, vanila ice cream, drizzled with caramel & chocolate sauce. 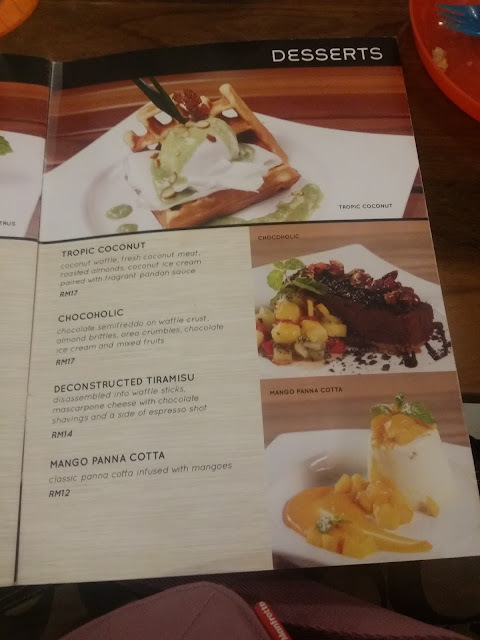 Coconut waffle, fresh coconut meat, roasted almoinds, coconut ice cream paired with fagrant pandan sauce. 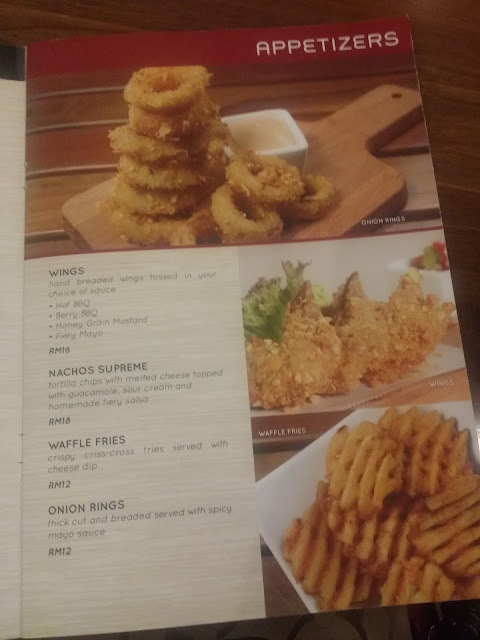 Thick cut & breaded served with spicy mayo sauce. Spicy savoury waffles, breaded homade chicken patty, purple rasin slaw, chicken juice & sriracha sauce. a great recipe to cool you down. 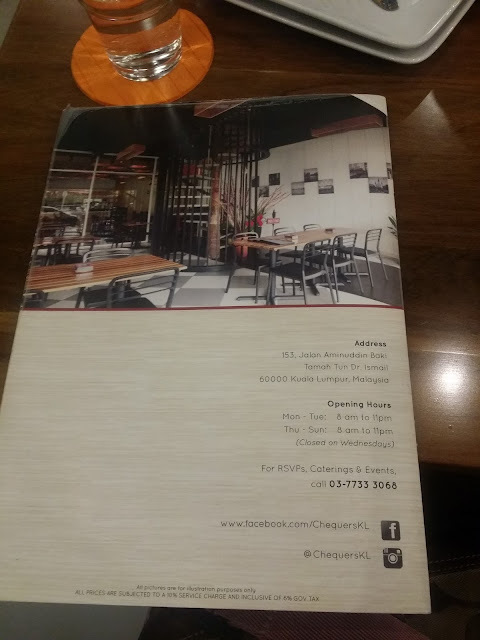 And now i gonna write some about this fabulous restaurant. 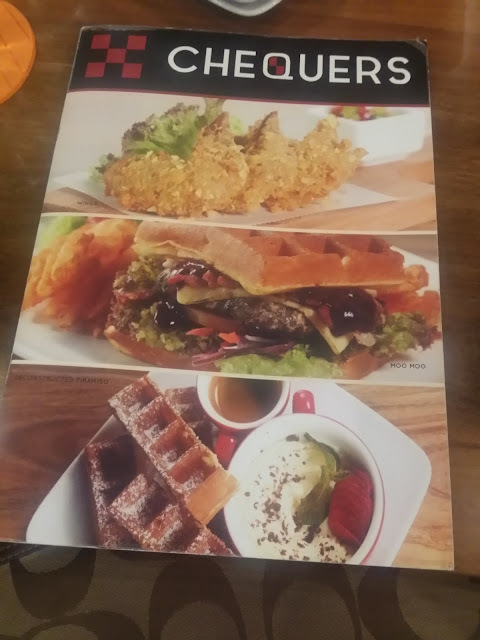 Chequers, an American diner restaurant that specialized in waffle dishes which also with other American influenced dishes available on the menu. 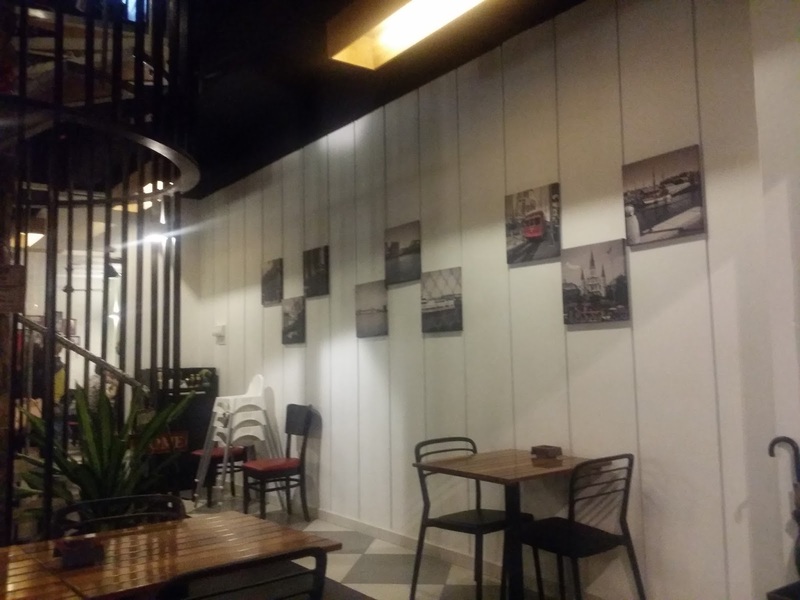 It has been in operation for 8 months, since 19 Novemeber 2014, serving great waffle breakfast, brunch, lunch, dinner, supper and dessert to the neighbourhood. 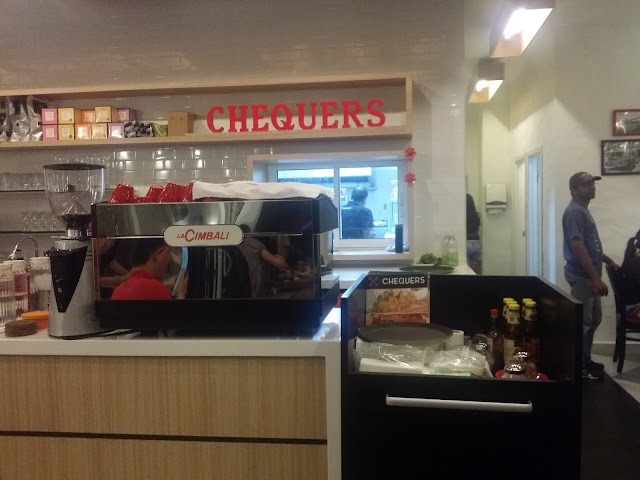 Chequers has the same pronunciation with the word “checkers” which represent the boxes concept that looks similar to a waffle, hence the owners, Michelle and Terrence named the restaurant “Chequers” to resemble their specialization of waffle dishes. 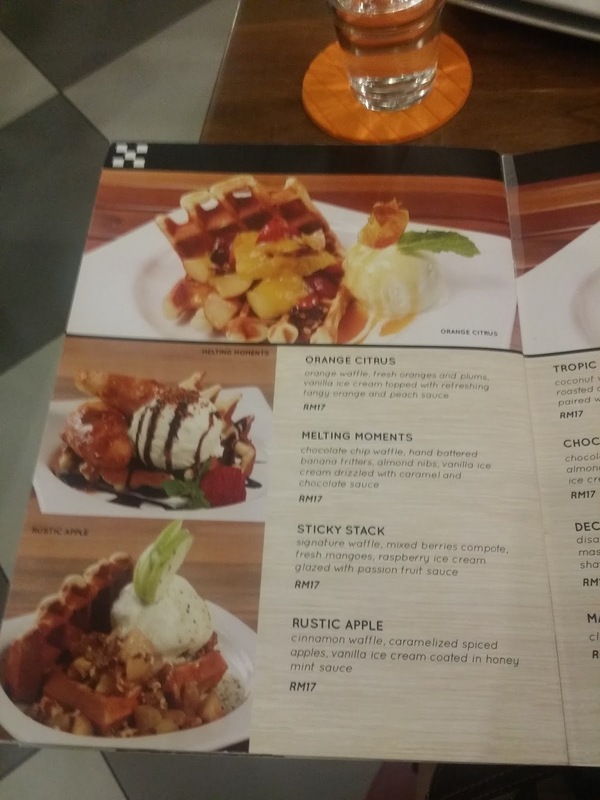 Covering from sweet to savory waffles, Chequers used different waffles to pair with different dishes that are love by people of all ages. 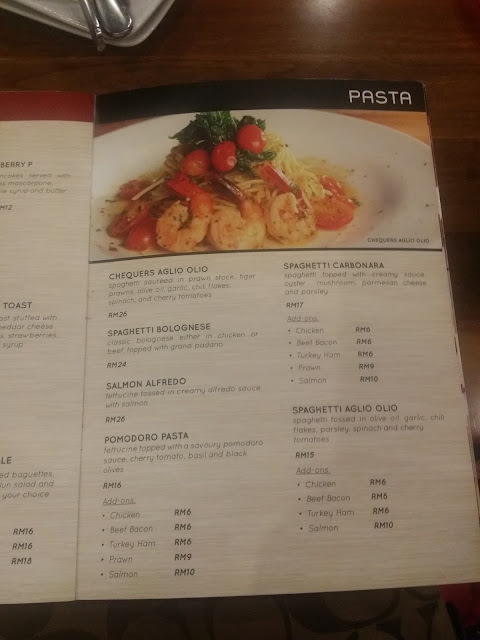 Me personally, i like the POMODORO PASTA. The texture of the fettucinni is so good. Soft & smooth.The sauce & chicken paired so well. Yummylicious. 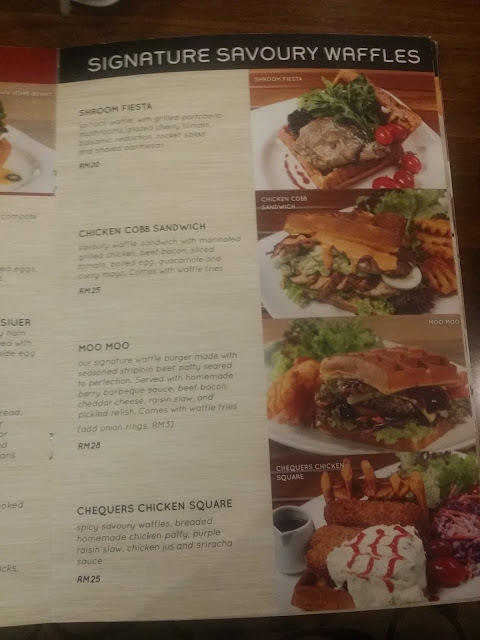 Portion wise, since most of the food here is served with 2 pcs of waffle, is kinda much for me, I cant even finish a set of savory waffle dish my own. This time is the 1st time invited by Food Ink to have this fantastic food test with some fellow food lovers.Thank you Food Ink & also the representative, Ms Stella. Shes a very nice & caring person. This restaurant do take reservation. For reservation, please do not hesitate to give them a call, and below here is their details. Food Review : D'king Vegetarian Snow Skin Musang King Durian Mooncake. As we all know, moon cakes is a necessaries for Mid Autumn Celebration for the Chinese. 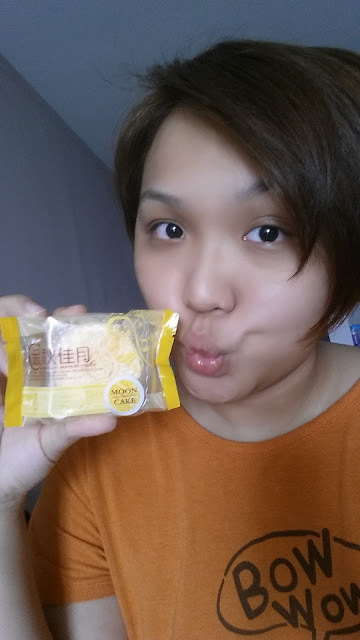 Now not only Chinese who likes to eats moon cakes, even our other races friend is waiting for this month to arrive and to taste all sorts of traditional and modern mooncakes. 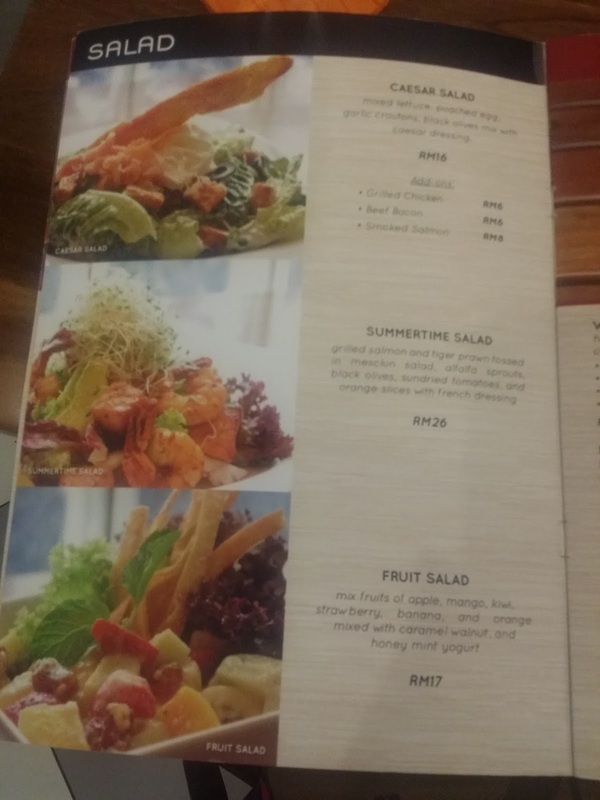 Dking is famous for the Malaysia Royal Fruits (Durian & Mangosteen) products. They sell all kind of interesting food such as Durian Icecream, Fried Durian, Mangosteen Juice etc. etc. 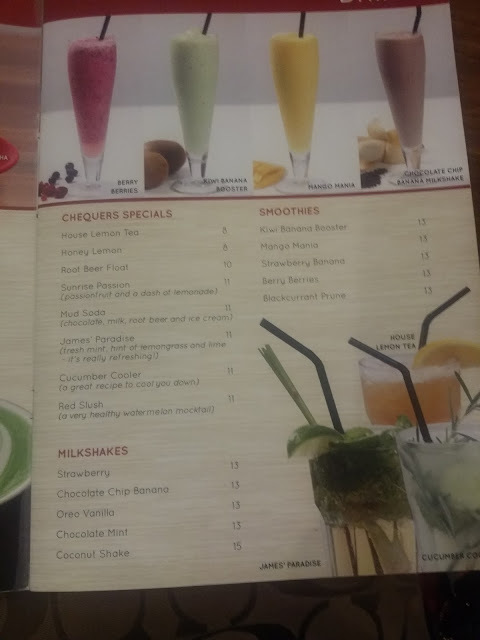 Have you ever tried them? They are all so delicious for me. 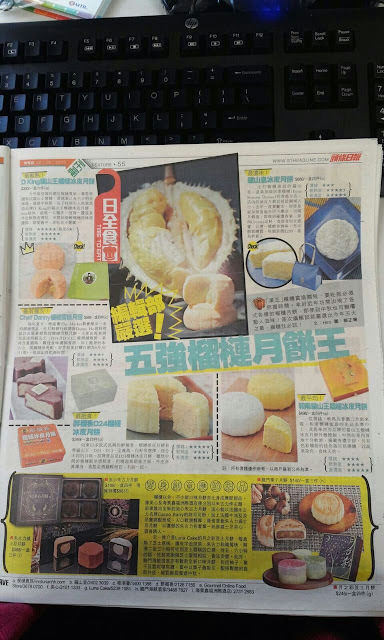 Today I have this opportunity to try their famous DKING VEGETARIAN SNOW SKIN MUSANG KING DURIAN MOONCAKE. It comes together with a Styrofoam Box and do contain a pack of ice gels. The ice gels are able to preserve the products within 10 hours. Handmade and does not contain preservatives and artificial flavouring. Packed with the highest-grade Musang King durians sourced from Pahang. 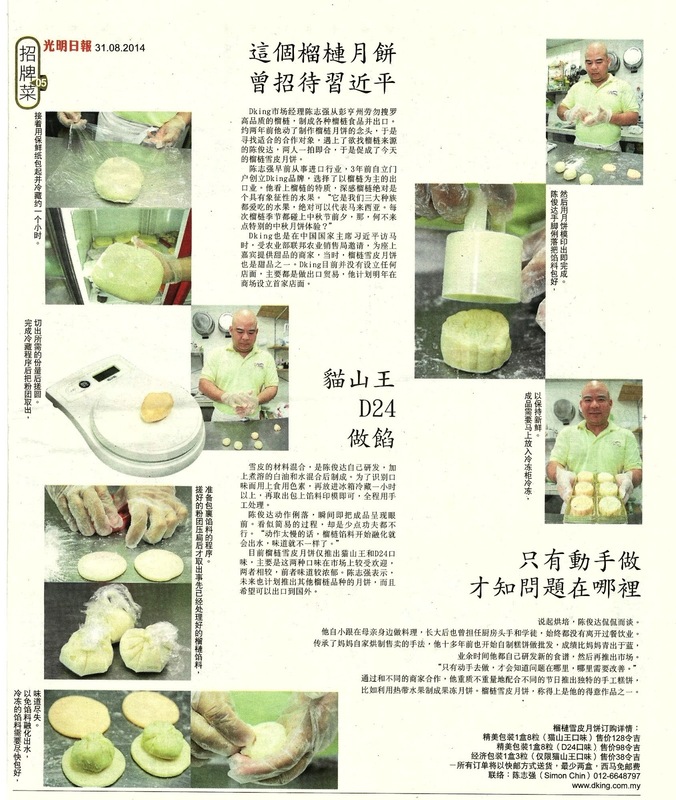 Unlike most mooncakes, which utilise processed filling, D’kingz mooncake is prepared with the actual durian flesh. 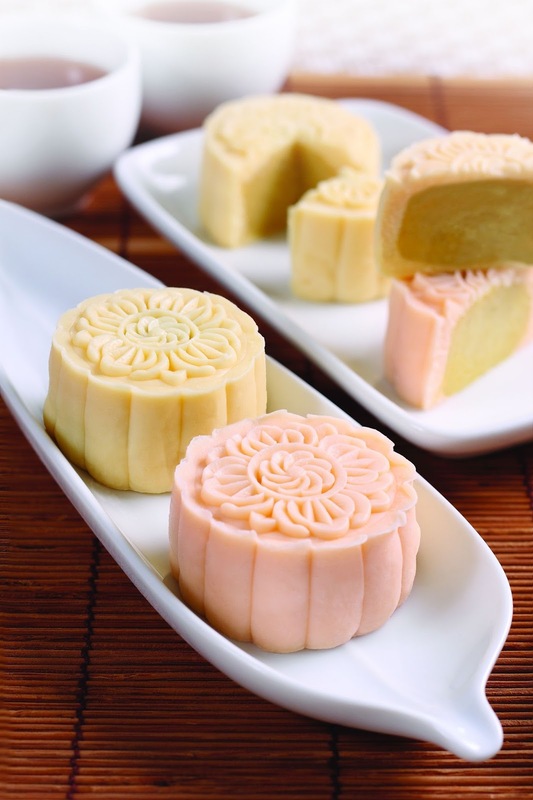 Make sure you keep it in freezer (-18 degree celcius), if not, your moon cakes will be smushie just like the below. Please do not store the Durian Pastry in chiller because it will damage the product and not recommended to defrost the pastry for more than 3 times since it is all natural, it will get damage very easily. Their famous D'king Vegetarian Snow Skin Musang King Durian Mooncake has featured in a chiness new paper and here are some cuts from the paper itself. After all the above pictures, words & video. 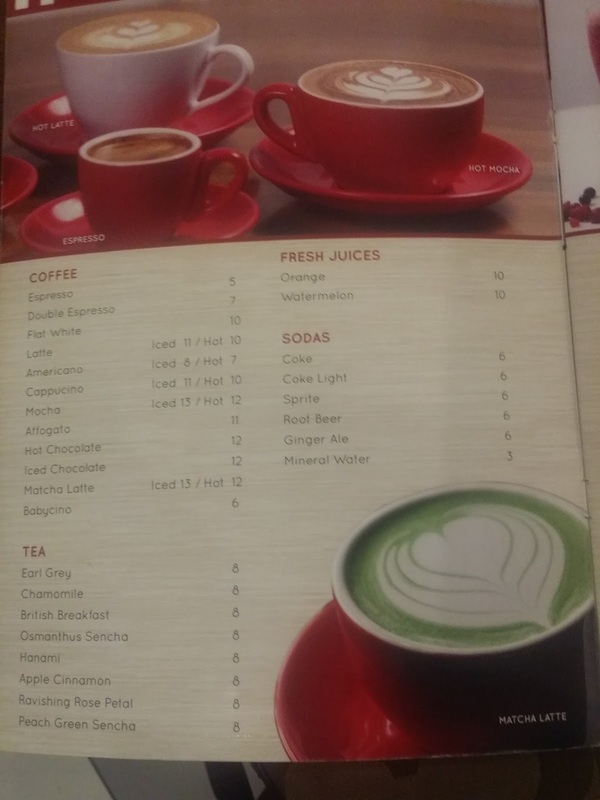 Everyone must be looking for the way for order and purchase. 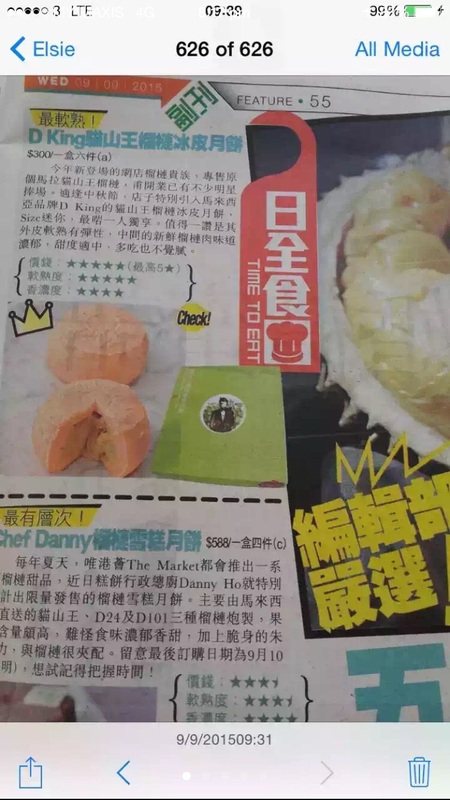 Here you go, follow the steps and walla, here comes your own D'king Vegetarian Snow Skin Musang King Durian Mooncake sent to your door steps. 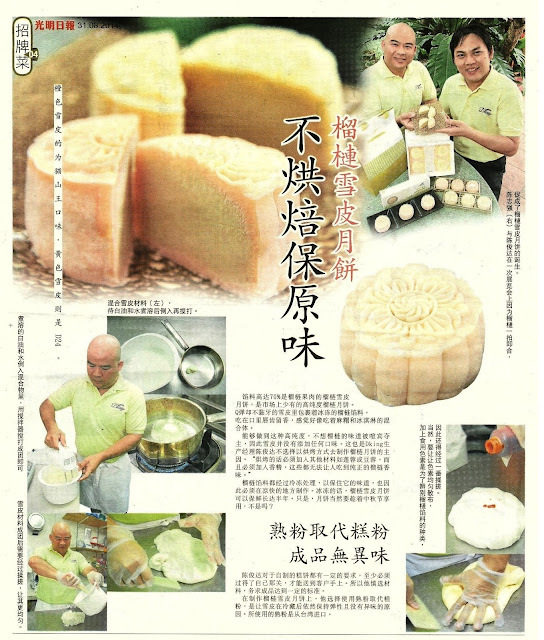 D’king vegetarian snow skin musang king durian mooncake is sold in sets of eight 60g mooncakes, at RM128 per set, although there is currently a promotional price of RM98 per set. Delivery is free if two or more sets are purchased.